Accessory Genie - Consumer Electronics and Accessories Industry News: Celebrate Grads! Thank You Dad! May is officially on its last legs and June is rapidly approaching. Summer is on the cusp with Father’s Day and Graduations igniting the excitement. Here at Accessory Genie, we want to help you celebrate all the Fathers and Graduates in your life. Starting Monday June 2nd and running through Monday January 9th, we are happy to offer FREE SHIPPING on any order on the site. Use the coupon code ‘DADSGRADS’ at checkout and receive all your presents with ZERO shipping costs!!! Use it to buy Dad a retro wood speaker like the GOgroove BlueSYNC WUD or our famous In-Car FM Transmitter, the FlexSMART X2. Buy your new grad a set of GOgroove BlueVIBE DLX Headphones or the newly released ENHANCE GX-H1 Gaming Headset. Whatever you choose the shipping is free! We all know why we celebrate graduations and what a great achievement and honor it is, but most of us do not know how and where Father’s Day started. Father’s Day was officially inaugurated in the United States in the early 20th Century and was seen as a complement to Mother’s Day. Father’s Day was founded in Spokane, Washington by Sonora Smart Dodd in 1910. Dodd’s father, William Jackson Smart, was a Civil War Veteran and a single father of 6. Dodd approached her pastor with the idea after listening to a sermon about Mother’s Day. She originally wanted to celebrate Father’s Day on her Father’s actual birthday but was unable to rush the process and the party agreed to make it the third Sunday of June. Dodd had little success with the holiday, eventually forgetting it completely when she went away to the Art Institute in Chicago. In the 1930s she returned to Spokane and that is when she began to pick up steam. Now that I have completely bored you with a history lesson, go out and shop for your Dad or Grad… They deserve it. 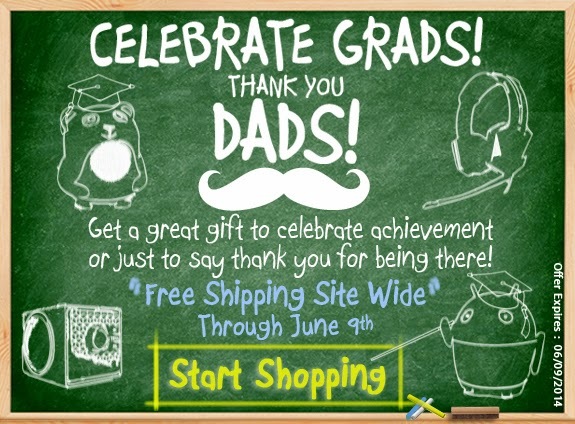 Remember to use the coupon code ‘DADSGRADS’ at checkout to receive free shipping on all orders!